Washington’s unilateral, egotistical steps, which resulted in increased confrontation and a decline in overall security, could encourage regional players to take advantage of the situation “on the ground”, ignoring international decisions. 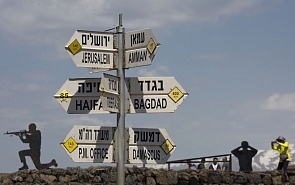 Donald Trump’s recognition of Israeli sovereignty over the Golan Heights mirrors the US administration's current policy of calling into question the role of international consensus in Middle East conflict resolution. This decision was preceded by a series of steps taken by the White House which indicated unconditional support for the interests of its main Middle Eastern ally and its security (as it is understood in Israel and the United States). These included the recognition of Jerusalem as the capital of Israel and the transfer of the US embassy there, the closure of the PLO mission in Washington, the suspension of financial assistance to the PNA and UNRWA, a tacit acceptance of the removal of the international group patrolling Hebron, and finally, removal from public rhetoric of such important words as “occupation” and “settlements”, with reference to Israel. Let us highlight several aspects that should be kept in mind when analysing and forecasting the situation, in light of the Arab reaction to Trump’s decision to recognise Israeli sovereignty over the Golan Heights (the results of the 30th Arab League Summit that ended on March 31 in Tunis). Arab-American relations remain a crucial factor affecting the region. Washington remains a strategic ally for the Arab countries, particularly the Persian Gulf states, and it is not likely that they will adopt a hard stance against American policies, including a flat rejection of Trump’s so-called “deal of the century” concerning Palestine. The development of Gulf-Israeli relations, however, remains a cause for some optimism. One should not be overly optimistic about the “general Arab unity” referred to in connection with the resolution which was adopted at the end of the summit, which condemns the unilateral steps taken by the White House. Trump’s decision on the Golan Heights was negatively perceived by even the most loyal American allies. Many of them (it is enough to mention Canada and the UK) unequivocally and categorically rejected Trump’s decision, supported the principle of “two states for two nations” and key international legal solutions that establish the framework for resolving the Middle East conflict. So we can address the declaratively passive position of the Arab world: the actual inaction against the background of the verbal statements, as well as its split, taking into account the increasing interaction between Israel and the Arab world, including the countries of the Persian Gulf. At the same time, it is obvious that the unfair decision of Donald Trump, which confirmed Washington’s bid for unilateral steps outside generally-accepted international law, will objectively complicate the American task of promoting its so-called “Deal of the century” for the Middle East. Following the Palestinians, the Arab world will be forced to publicly tighten its position. An eventual decision by the Arab leaders to agree with the “exchanges” proposed by the United States will mean the risk of “losing face”. Additionally, a critical mass of discontent caused by the series of anti-Palestinian measures taken by the US administration can serve as a sort of “safety net” from the hasty consideration of the American package proposals. In favour of this is the “pre-election” statement of Benjamin Netanyahu (made explicitly after Trump’s decision) that Israel will not withdraw settlements from “Zone C” in the West Bank – a clear blow to the working framework of the two-state solution. Whether President Trump understands his decision or not is anyone’s guess. Yet, his recognition of the Israeli annexation of the Golan Heights only escalates an already tense situation between Tel Aviv on one side and the two sides of the Syrian Civil War, Damascus and Tehran on the other. Further, it gives no incentive for Israel to negotiate some sort of peace accord with both Syria and Iran—something that is absolutely vital if tensions are to be reduced both in Syria and in the region. The undoubted beneficiary of Trump’s next step in the direction of “new realities” in Middle East crisis resolution is Iran. Against the background of a relatively “toothless” reaction from the Arab League toward the White House’s decision, which marginalised the Palestinians even more, Tehran has an opportunity to occupy an even more vigorous position as a defender of the oppressed Palestinian people (and at the same time of an all-Arab case, “betrayed” by the same Arabs). In fact rather than in word, Iran will help its Palestinian brothers defend their right to establish an independent state in accordance with internationally-adopted decisions. We can expect increased Iranian support for Hamas, Islamic Jihadists and other Palestinian groups, which rely on armed fighting methods for fulfilling the aspirations of the Palestinian people, as well as other steps by Tehran aimed at supporting anti-Israeli forces in the region (Hezbollah and others). The most recent US move, to designate Iran’s Revolutionary Guards as a terrorist group, plays directly into the hands of “hawks” in the Iranian leadership, who are convinced of the need for more imprudent steps in the region. Qatar can also increase its support for the Gaza fighters, and amid the ongoing crisis in the GCC and the Quartet+ boycott, it could also beneficially position itself as a “protector of the Palestinian brothers.” With the growing rivalry among external players in the Palestinian territories, such a scenario is also beneficial to Israel, since it objectively works to deepen the inter-Palestinian split. Additionally, the transparent anti-Iranian conditionality of most Washington’s steps in the Middle East will most likely hinder US plans to create a “Strategic Middle Eastern Alliance”, and Qatar can distance itself from taking part (due to “special” relations with Iran), as well as other Persian Gulf countries. The prospects of opposing Tehran’s cooperation with Israel are becoming increasingly “toxic”. Paradoxically, the winner is Syria. First, the support, albeit declarative, of the Arab ummah can (and should) be perceived by the leadership of the Syrian Arab Republic as a step towards the restoration of its legitimacy. Second, Damascus (with support of Iran) now has a sensible justification for taking steps to militarise the situation in the areas adjacent to the Golan Heights (first of all, it concerns the disposition of Hezbollah’s forces). This situation objectively complicates the position of Russia, which took several steps, taking into account Israel’s security imperative. It means the withdrawal of pro-Iranian forces from the Golan Heights region, as well as the deployment of Russian military police through the demarcation line, ensuring the UNRDA’s return. Trump’s decision has the potential to make the situation uncontrollable again. Washington’s unilateral, egotistical steps, which resulted in increased confrontation and a decline in overall security, could encourage regional players to take advantage of the situation “on the ground” (for example, in the form of some kind of “blitzkrieg”), ignoring international decisions, which are ignored anyway. Under these conditions, the demand is increased for Russia’s role as a responsible player, a kind of guarantor of internationally recognised norms, the UN Charter and the principle of group decision-making in the world arena.